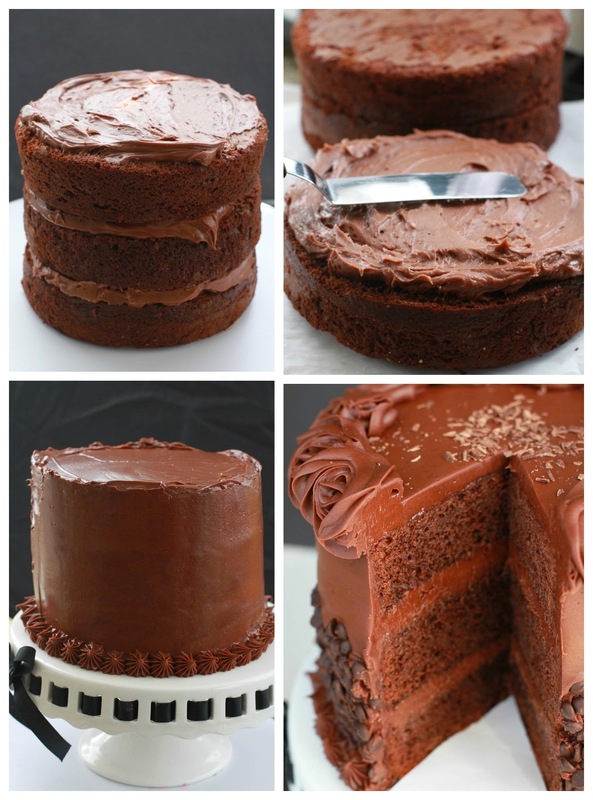 Triple Chocolate Layer Cake with the best easy milk chocolate frosting & partially covered with mini chocolate chips. Perfect for birthdays or any other special occasion. 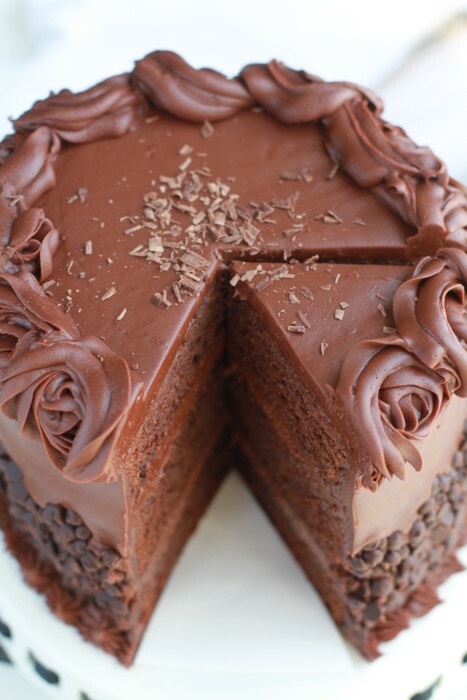 Out of all the cakes I make, chocolate cake is the one that shows up the most frequently at our house. 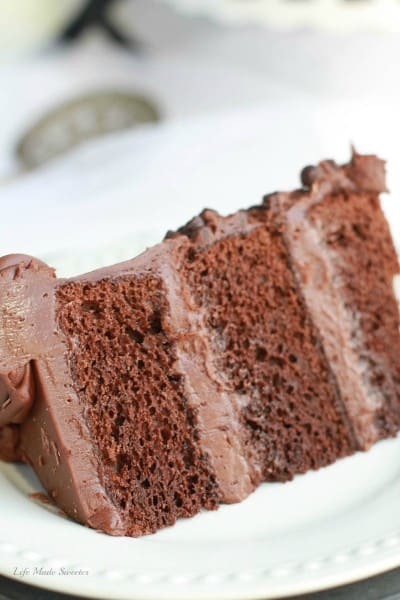 I made this cake back in March and since we’re celebrating our eight year wedding anniversary today I thought it was the perfect occasion to share my chocoholic husband’s very favorite chocolate cake that he deems to be the best ever triple chocolate layer cake. 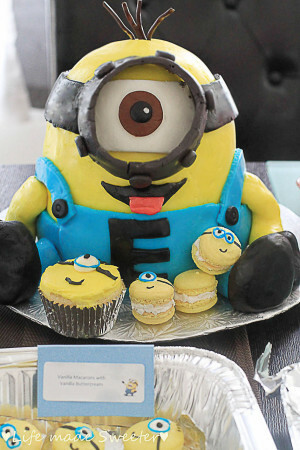 It has been my stand-by recipe for birthday cakes and special events for the longest time. 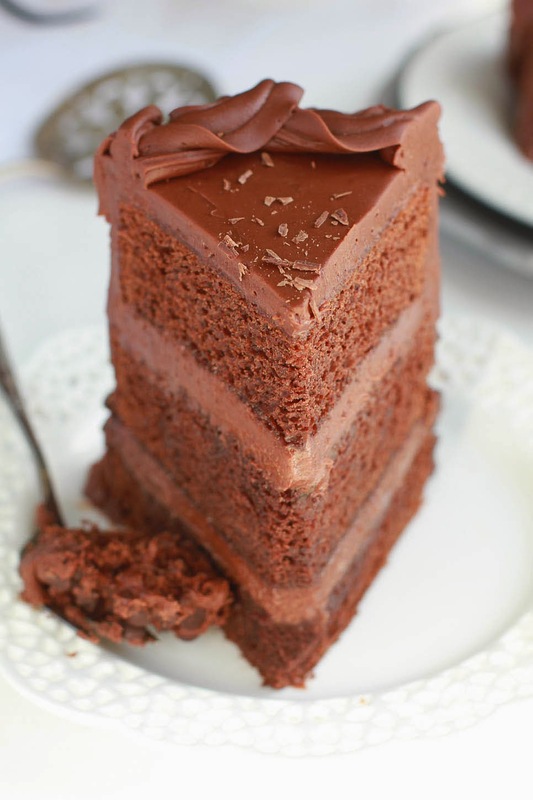 And just like my favorite vanilla cake, I’ve tested and tweaked a lot of chocolate cake recipes over the years. Measure your flour with the spoon and level method –>scoop flour into a measuring cup using a spoon. Level off with a butter knife. Batter will be thin after combined, which is how it should be. Use cake strips on the side of the pan to help with even baking temperature and rising. 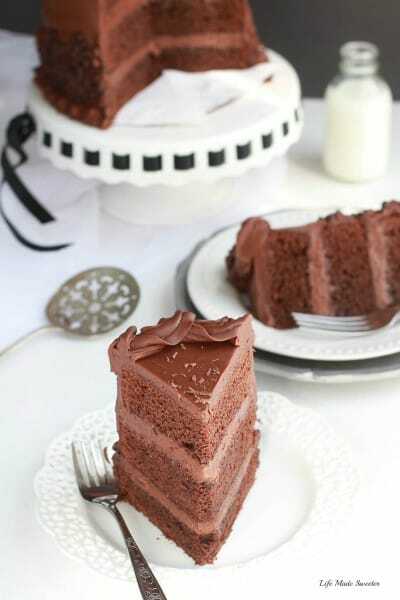 The cake is soft, tender and intensified with a rich chocolate flavor. As much as I love Swiss Meringue Buttercream, this creamy buttercream frosting I used today is my husband’s favorite and comes together easily in one bowl. 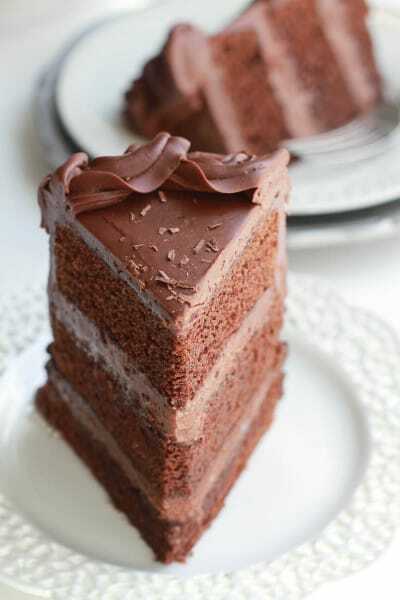 It has a velvety smooth texture and together with the decadent cake it is a dream come true for devoted chocolate lovers! It’s also a dream to decorate and just glides on silky smooth. You can have some fun and decorate this triple chocolate cake however you like. My favorite way is actually unfrosted with just a smidgen of frosting on the top. For this special occasion, I chose to pipe a cute little star border on the bottom as well as added Amanda’s legendary rose swirls to the top. Mini chocolate chips are studded on the bottom. To finish it off, some chocolate shavings get sprinkled on top. 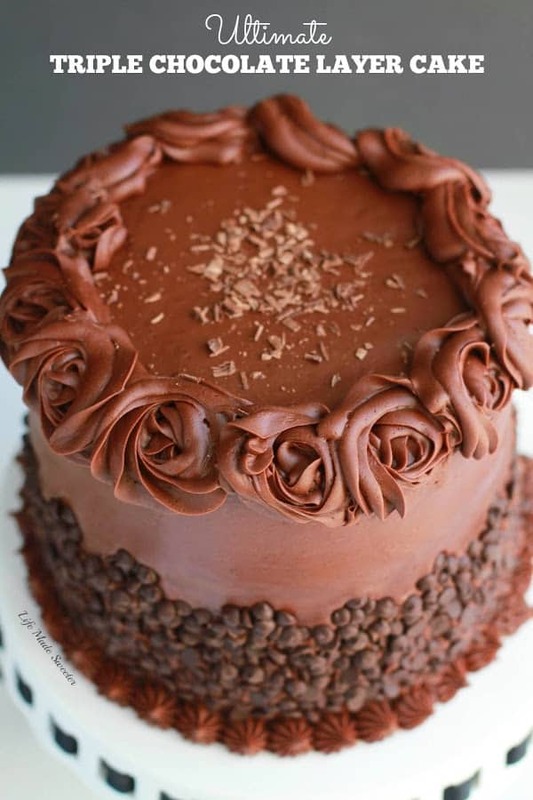 A triple layer devil's chocolate cake with milk chocolate frosting partially covered with mini chocolate chips. Preheat the oven to 350 degrees F. Prepare three 6" or two 8" round cake pans by spraying with baking spray, dust with cocoa powder and shake out the excess. Line the bottoms of the pans with parchment paper and set aside. 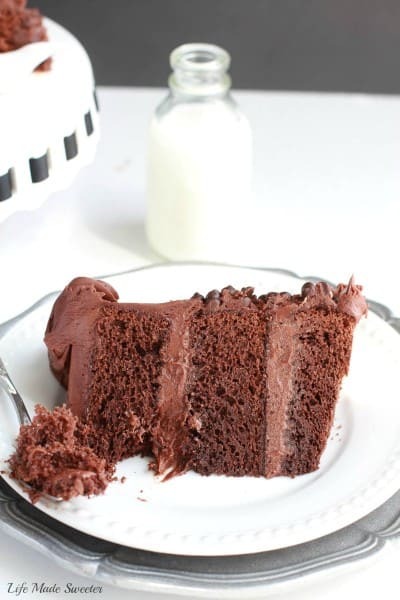 Using a hand mixer or a stand mixer fitted with the paddle attachment, combine the flour, sugar, cocoa powder, baking powder, baking soda and salt. Mix on low for 30 seconds or until thoroughly combined. Add eggs, buttermilk, sour cream, oil and vanilla. Beat on medium speed for about two minutes until smooth. Reduce speed and slowly add boiling water to the cake batter. Turn mixer to high and beat for about 1 minute until ingredients are incorporated. 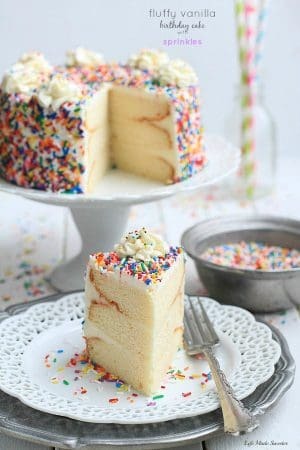 Distribute cake batter evenly between the prepared cake pans. 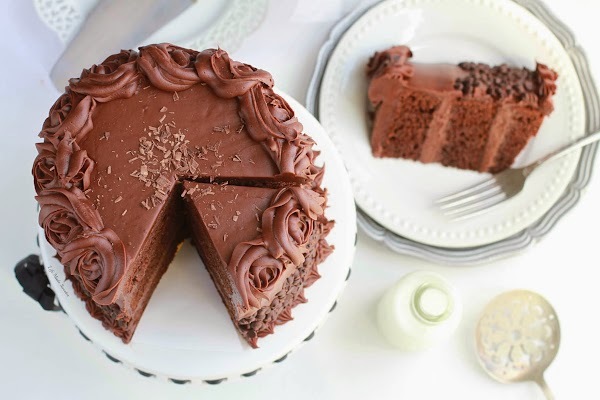 Bake for 30-35 minutes, or until a toothpick or cake tester inserted in the center comes out clean. Remove from the oven and allow to cool for 15-20 minutes, remove from the pan and cool completely on wire rack. Make the frosting: Using a handheld or stand mixer fitted with a paddle attachment, cream the butter on high speed until light and creamy, about 5 minutes. Turn mixer to low and slowly add the sifted cocoa powder and sifted powdered sugar 1 cup at a time. Beat until sugar/cocoa until combined. Turn mixer to medium speed and add the vanilla and cream 1 tablespoon at a time and beat until smooth. Switch to high speed and beat for 1 minute. You may need to add more cream or more powdered sugar depending on consistency desired or if you'd like to increase the frosting's thickness. Taste, and add salt to taste. 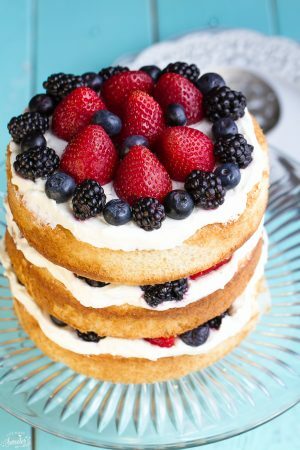 Assemble the cake: Place 1 layer, flat side up, on a plate or cake stand. With a knife or offset spatula, spread the top with about 1/2 - 2/3 cup frosting. Place the second layer evenly on top, and press down gently so cake layers stick. Spread another 1/2 - 2/3 frosting evenly on the top. Position the third layer, bottom side up, on top of the frosted layer and add frosting to the top and sides of the cake with a very thin layer of frosting (the crumb coat). Refrigerate the cake for about 15 minutes to let the crumb coat set up. Ice the sides and top of the cake with the finishing coat. Decorate with chocolate chips or as desired. 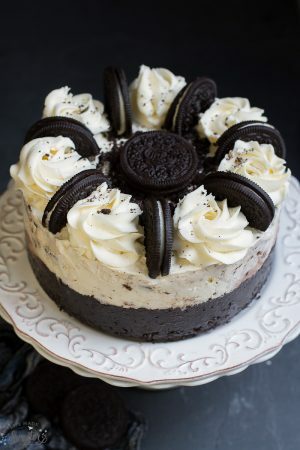 This recipe can also make a two layer 8 inch or 9 inch cake. The 8" inch cake will have taller layers. 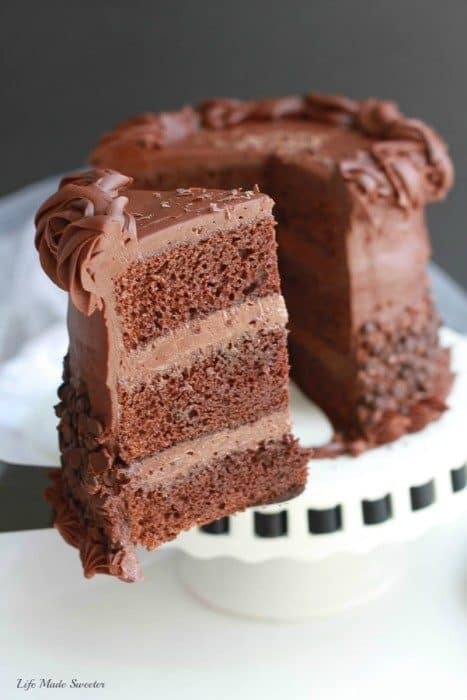 Frosting amount is enough to frost a 9" inch 3 layer cake generously. You may have some leftover which can be stored in an airtight container in the fridge for up to 3 days or in the freezer for 3 months. 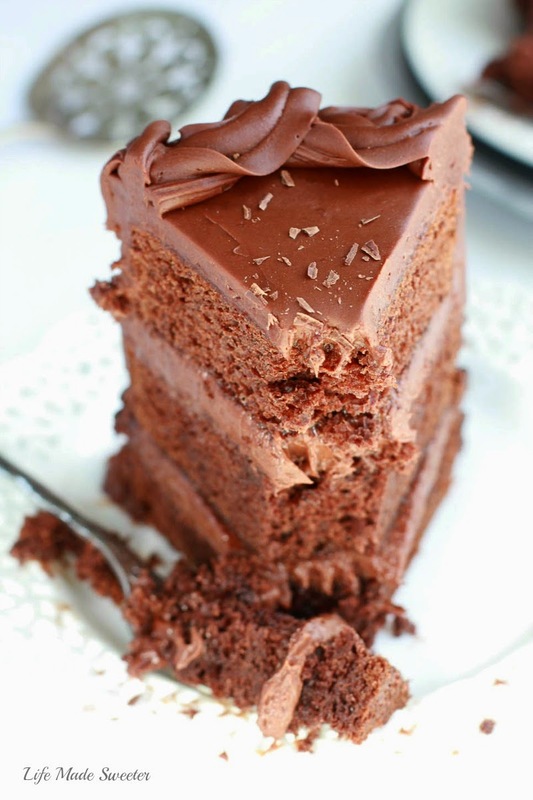 If frosting appears too dry, add more cream, one tablespoon at a time until it reaches the right consistency. If it appears too wet and does not hold its form, add more powdered sugar, a 1/4 cup at a time until it reaches the right consistency.